Since Council’s rather sudden announcement that they had decided to cancel stage 5 of the North Brisbane Bikeway in favour of an east-west connection to the Kedron Brook Bikeway at Lutwyche, a number of members of Brisbane North BUG have expressed concern about how the interface to the Lutwyche Bus Station would work on the western side (closest to Kedron Brook). Currently, cycling access to the Lutwyche Rd underpass is via the footpath on Bradshaw St, which is moderately steep and quite narrow. Having noticed that the land behind that footpath is for sale, we went looking for more information about the advertised development there. What we discovered is very concerning: it will be an 8-storey mixed-use building, with commercial tenancies (shops and cafes) opening directly onto the Bradshaw St footpath – which will be covered by an awning. With this information, we can’t see any way a viable bikeway can be constructed along Bradshaw St between Lamington Ave and Lutwyche Rd. Any alternative path through the Lutwyche Bus station would be a major engineering challenge, and would be very costly and disruptive. 23 August 2016: TMR Director of Property Acquisitions and Disposals signs a Landowner’s consent for a developer to make applications to Brisbane City Council to develop the land on the corner of Lamington Ave and Bradshaw St.
Tuesday 23 October 2018: the proposed western diversion of the North Brisbane Bikeway was first floated by Brisbane City Council in a semi-public forum. (We were only aware of this because Belinda attended the Public and Active Transport Committee meeting that morning). Friday 26 October 2018: Council approved the development on the corner of Lamington Ave and Bradshaw St.
Tuesday 30 October 2018: the report of the committee meeting from 23 October was tabled and discussed in the main Council meeting. Tuesday 6 November: Deputy Mayor Adrian Schrinner confirmed that Council had decided on the link via Lutwyche Bus Station, and has the necessary support from TMR via Minister Mark Bailey, based on a phone conversation the previous day (Monday 5 November). Thursday 22 November: Local Councillor David McLachlan confirmed verbally that the bikeway route will be via the underpass at Lutwyche Bus Station (not over the top of Lutwyche Rd with a beg-and-wait cycle at the lights). At least we have the assurance that TMR will (eventually) build stage 4 of the North Brisbane Bike along the original route as far as Price St, Wooloowin, because it’s difficult to see how this western link proposed by Council can be made suitable for a major bikeway. 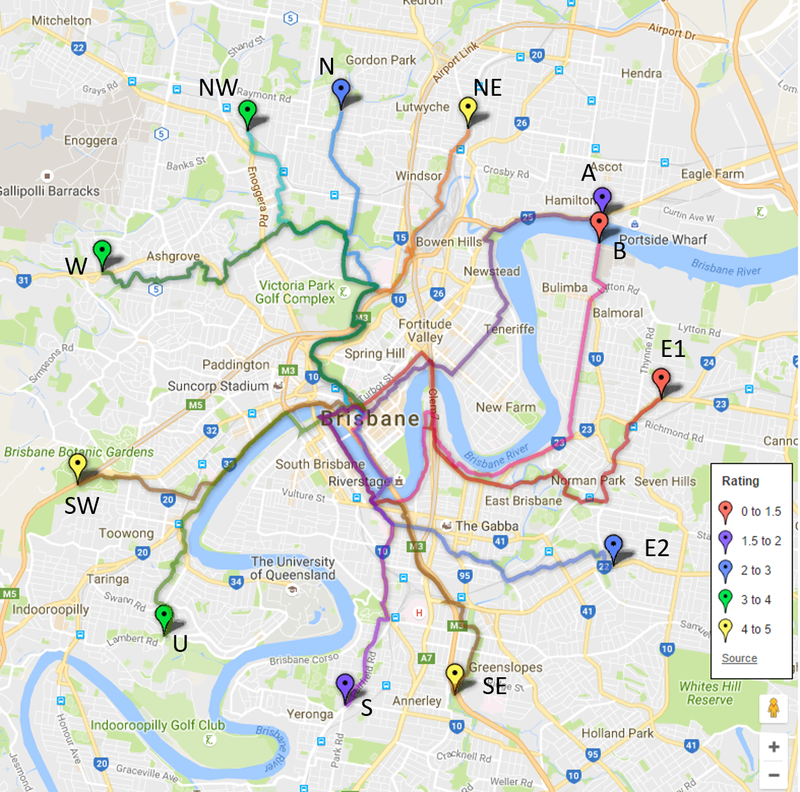 Council promoted the western link (shown in red) as having less conflict points than the previous proposal for Stage 5 of the North Brisbane Bikeway via Kent Rd. That somehow ignores the conflict points through the Lutwyche Rd underpass (or crossing Lutwyche Rd if the underpass is not used), and down Bradshaw St to Lamington Ave.